I grew up eating this Meatloaf. It is one of my favorite recipes for many reasons. I usually mix one up and keep it in the freezer for an easy dinner. This is a no mess recipe. Well, if you can call it a recipe because I tend to cook by throwing things together - not really measuring so take my measurements with a grain of salt please. To make this a no mess recipe, I mix the first 3 ingredients together in a plastic bag, keeping my hands clean. Forming it into a loaf, I place it in my loaf pan (minus the bag) and top with the bacon. Bake it in the oven at 350 degrees for an hour. Throw in a couple of potatoes and you have an easy peasy dinner. We were so hungry we dug in and I forgot to take a glam shot of the results - I'll add it next time. We have this as a regular meal. I store the stuffing in the freezer. 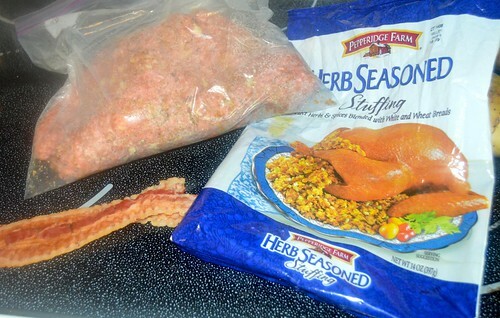 I use the herb flavored stuffing because it contains all the spice and flavor in one ingredient. I use a loaf pan that lets the grease drop down making it less messy to serve and healthier to eat. The bacon is optional but who doesn't love bacon! If you don't plan on cooking but want to freeze it, after mixing in the bag, just put the bag in the freezer to use later.